The best college for a student is not necessarily the highest ranking in the Forbes’ listings, but the one that offers a student the most career opportunities. Technical training programs are a low-cost alternative to attending a major university, and you can end up earning a lot of money working as a highly-skilled technician, or by starting your own small business. Lanier Technical College (aka LTC or “Lanier Tech”) is a community college in Georgia’s Technical College System that serves as the foremost workforce development resource in north Georgia by providing career-technical education programs through traditional and distance delivery methods leading to Associate of Applied Science degrees and Technical Certificates of Credit. In addition to meeting the needs of area students, Lanier Tech meets the needs of employers by offering customized business and industry training and economic development services, continuing education for technical and professional development, and adult education services. Lanier Tech was established on September 1, 1966, and moved into the first building at its current location in January 1967. Today it has multiple campuses providing education services for a seven-county area in north Georgia: Banks, Barrow, Dawson, Forsyth, Hall, Jackson, and Lumpkin counties. 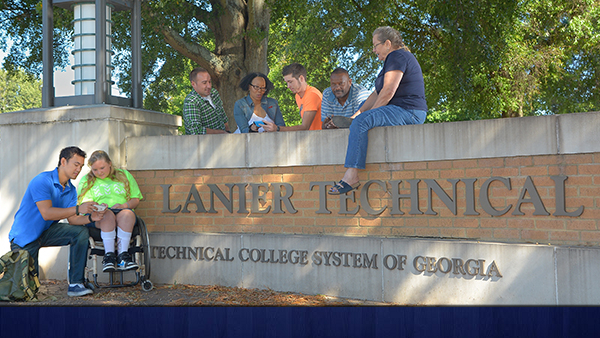 Lanier Tech is accredited by the Commission on Colleges of the Southern Association of Colleges and Schools. Many of the school’s individual technical programs are also accredited by their respective accreditation organizations. Lanier Tech’s technical programs and courses are offered using up-to-date instruction, industrial-standard equipment, and work-based learning. Instruction is offered on-site both day and night, as well as through web-enabled distance-education delivery. Technology now makes it possible to overcome some of the barriers to obtaining an education. Taking classes via the internet offers students a powerful tool to triumph over factors such as time and geography which would prevent them from attending classes offered in a traditional format. Imagine being able to take the classes you want “anytime and anywhere.” That is the promise of online learning. If you have a busy schedule, full of work and family responsibilities, or if you do not live close enough to regularly attend class on campus, then an online learning program may be for you. These days, an online degree can be just as marketable as a college degree earned on campus. The online courses at Lanier Technical College allow you to easily access lessons, communicate with your instructors, and complete assignments. One note of caution must be given. The most successful online students are those that are able to complete assignments on schedule with little or no direct supervision. In other words, self-discipline is required. Online classes are not “independent study” classes. They require active participation in the class, submitting assignments on time, and taking exams in accordance with a pre-determined calendar. Naturally, the online student must have access to an appropriately configured computer with internet access and the proper software to ensure successful course completion. The Dual Enrollment program at Lanier Technical College gives you a jumpstart on your college career, while saving both time and money. With Dual Enrollment you enroll in a college class and get credit for both high school and college. Plus, you have the option of taking classes at any one of five campuses or online. The more credits earned while in high school, the more time and money you save. You can earn enough credits to skip up to two years of college. It can save your parents thousands of dollars on the traditional cost of college by saving on tuition, dorm cost and meal plans. The Dual Enrollment program allows for students in grades 9-12 to participate. Students enrolled in Georgia public high schools, private high schools, or home study programs (operated in accordance with O.C.G.A 20-2-690) are eligible to participate. Homeschool students may choose to participate in Dual Enrollment by having their parent completing the Dual Enrollment Funding Application and Participation Agreement for Home Study. All three sections of the application must be completed and submitted to the Georgia Student Finance Commission (GSFC).